It seems pretty simple. You press a button on the garage door opener remote, and your garage door magically opens or closes. However, there’s much more to it. Garage door systems are complex works of engineering found in homes across America. When you activate the remote control, it sends a 315 MHz signal to the garage door opener. The radio signal also has an encoded binary number detected by the receiver, which triggers the door to open only if the correct number is detected. Rather than a single number set during garage door installation, a new code is generated by a special chip (in the radio transmitter and receiver) every time. Resetting the code prevents hackers from obtaining one code and resending it to break in. 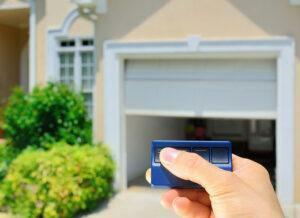 The garage door opener is the heart of the system. It consists of many different components. Operating at ½ hp, a garage door opener motor converts a 120-volt current to motion overcomes the inertia of a garage door weighing hundreds of pounds. It can raise the door, lower it, and stop it from moving too fast or crashing down to the floor. Smaller motors have an inverter, which converts AC power to DC current. This is used to operate the door and charge a backup battery. This battery comes in handy when there is a power outage and someone needs to get in or out of the garage. The drive mechanism is also one of the most important parts of a garage door. When activated, the motor moves either a belt, chain, or long screw. A belt drive tends to be quiet but can be expensive. The teeth built into the rubber catch on the gear as it rotates, pulling the trolley that opens and closes the door. Built similar to a bicycle chain, a chain drive is less costly. It slackens when the door is open and tightens when it closes. The chain is highly efficient at moving the door, although it can make quite a bit of noise. By contrast, a screw drive is a continuous threaded shaft, or steel rod, that connects the operator to the trolley, to the door. Since there are few moving parts, a screw drive requires less maintenance. Your garage door company will install and service a wide range of parts and address various settings. Height adjustment is an important aspect of garage door function. The operator is set to gauge the distance the garage door travels; it therefore senses whether the door opens or closes completely. It can stop the door if there’s a problem or adjust its motion if resistance is detected, such as if someone grabs the door. Modern garage doors also have electronic eyes, or sensors, which use an infrared radio signal to create a beam of light. You can’t see it, but this beam is broken when a child, pet, or ball breaks its path. A broken signal triggers the electric motor to stop and reverse, causing the door to open if it was originally closing. But like anything mechanical, garage doors require maintenance and repairs. Mechanical components will eventually wear out even with regular maintenance and lubrication (if needed). You can trust Precision Door Service for professional garage door repair in Fresno; we can troubleshoot, fix, or replace any component; conduct a balance test; or safely replace springs, cables, and other parts. To schedule an inspection or Fresno garage door repair, call our Fresno office at 559-480-2955.